Santa Rosa, CA—During the holiday season, even the best-laid plans can devolve into an improv routine. For assistance dog users, that routine can get a whole lot hairier — pun intended. Take a look at these tips from assistance dog organization Canine Companions for Independence® to help the season be about friends and family rather than focusing on the added stresses of traveling with a disability and an assistance dog. When in doubt, take a breath. The holidays are about seeing friends and family and sharing in the warmth of the season. Whether your assistance dog joins you for the festivities or not, you’re sure to want to remember them this year. 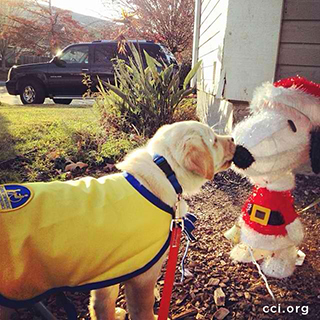 To learn more about Canine Companions and how to Give the Gift of Independence and Give a Dog a Job®, visit cci.org.